The weather this weekend has been amazing! It was such a teaser because it felt so much like spring with the 60 degree temperatures. We decided to take advantage of it and traveled to the nearest mountains. What I will miss most about Knoxville is being so close to the Smokey’s, but the Greensboro area has a couple of mountains close by too! 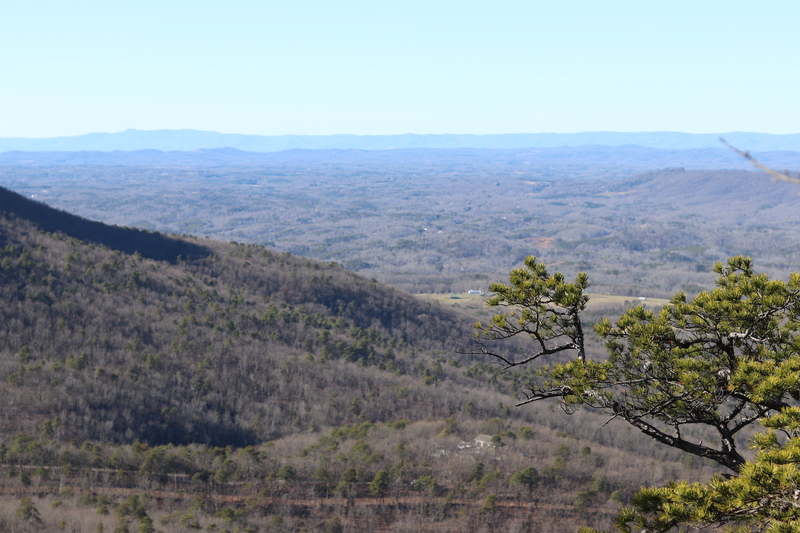 The closest ones to us now are Pilot Mountain and Hanging Rock, which are in Danbury, NC. The town next door is actually called Mt. Airy, where Andy Griffith is from (fun fact). My husband and I used to go hiking ALL the time before we got married. Then I got pregnant and the frequency slowed down some but we still went quite a few times last year. 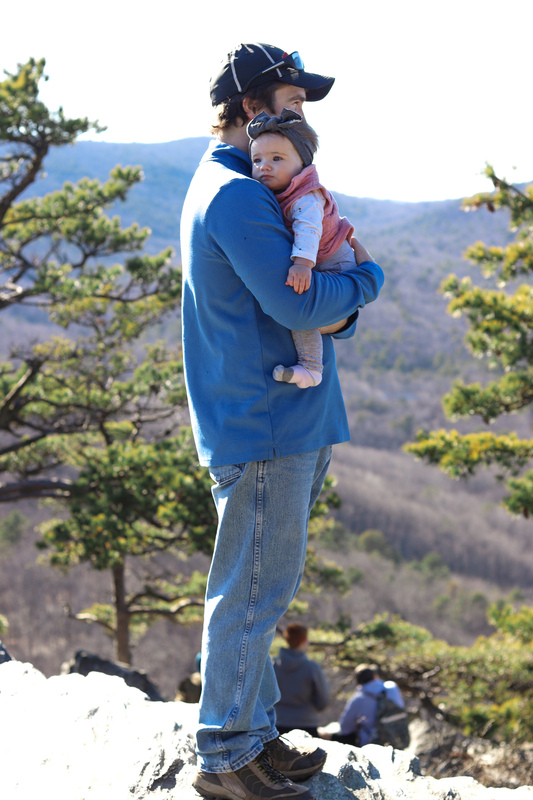 About 3.5 years ago, the summer before I went to nursing school, Brendan and I went on a 10-day road trip hiking and camping throughout parts of the Blue Ridge, Shenandoah and Great Smokey mountains. Towards the end of the trip we stopped at Hanging Rock State Park and Pilot Mountain. 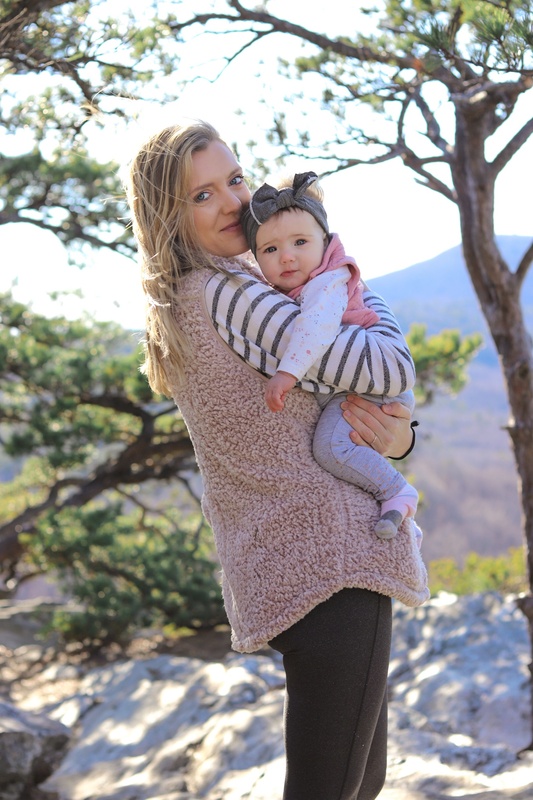 We remembered Hanging Rock was a fairly short hike so we decided to take the little babe there and check it out again this weekend. 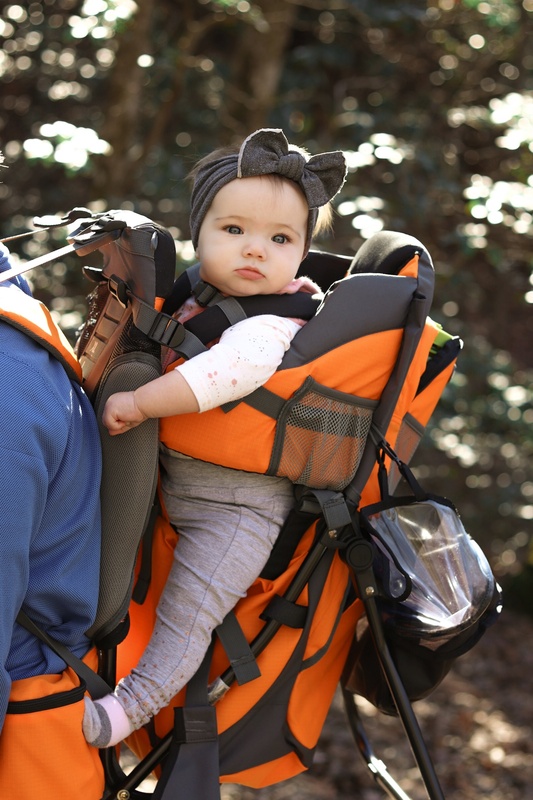 There is also a review of the Luvdbaby baby/toddler hiking carrier towards the end of the post for those interested! The drive was about an hour away. 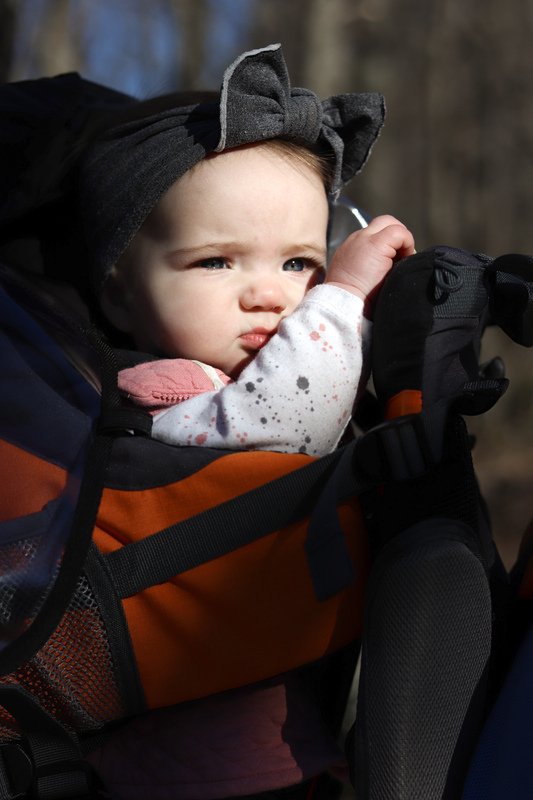 Thankfully Hadleigh got a nap in so she was in a good mood for most of the hike 😁 There were actually a good amount of people there taking advantage of the weather. LOTS of dogs, which Hads really enjoyed. 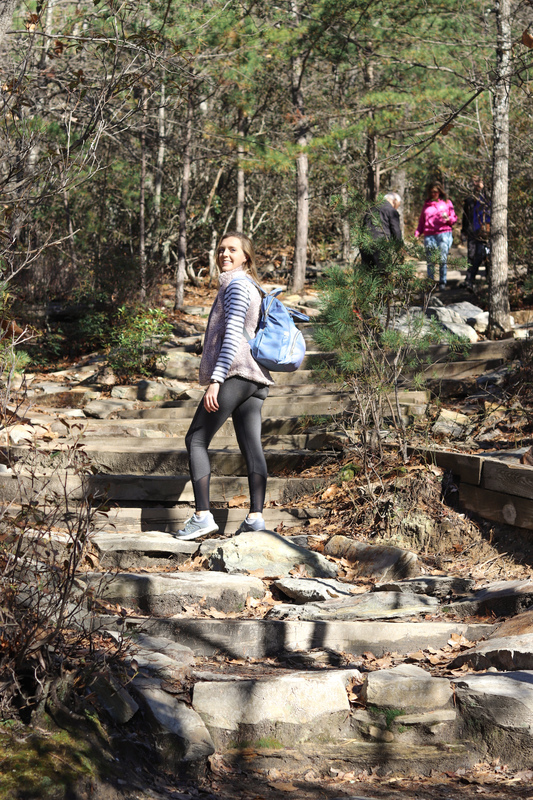 There are several different hikes you can go on once you get to the parking lot of Hanging Rock. The hike we chose was a total of 2.6 miles round trip. It was paved for the first quarter-mile and then the rest was dirt, gravel with large rocks towards the end. 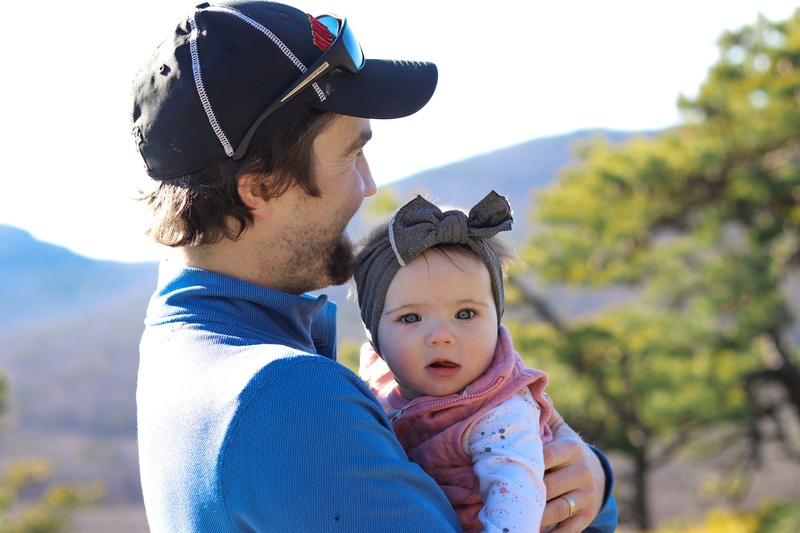 The hike would have been a breeze back when I was in shape and didn’t have to lug a 17 pound baby and all of her things. It was a mostly elevated trail…so we were FEELIN it big time. Once we got towards the top the elevation increased by quite a bit and the terrain became a little rougher. The rocks we had to climb up were wet from the rainfall the night before. 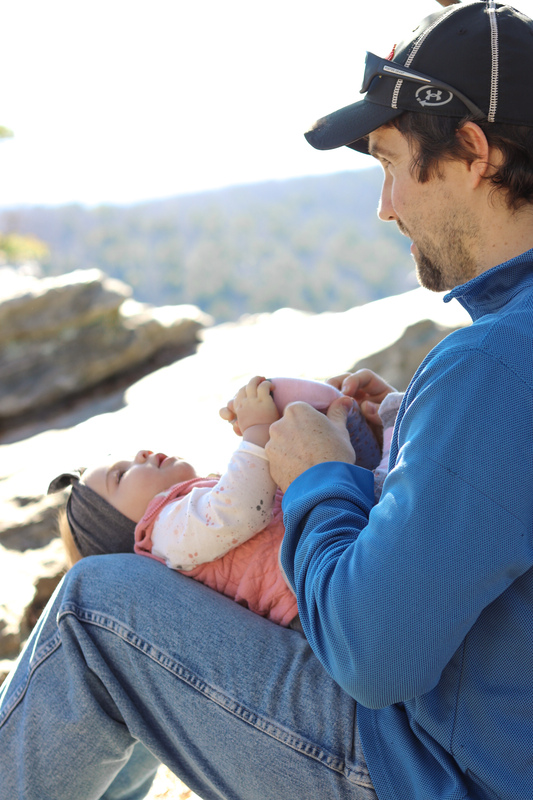 We actually witnessed someone slip…so I was a little nervous hiking up with the baby. But Brendan is way more agile than me so it wasn’t an issue for him to carry her up! Once we got to the top it as a lot cooler and windier than we anticipated. 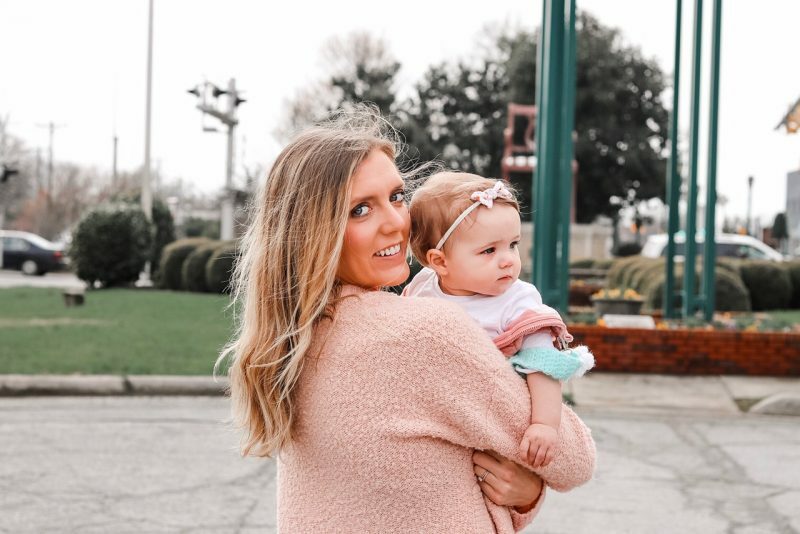 I felt like such a bad mom because Hadleigh’s hands were starting to get cold and her little nose was turning red! Whoops! 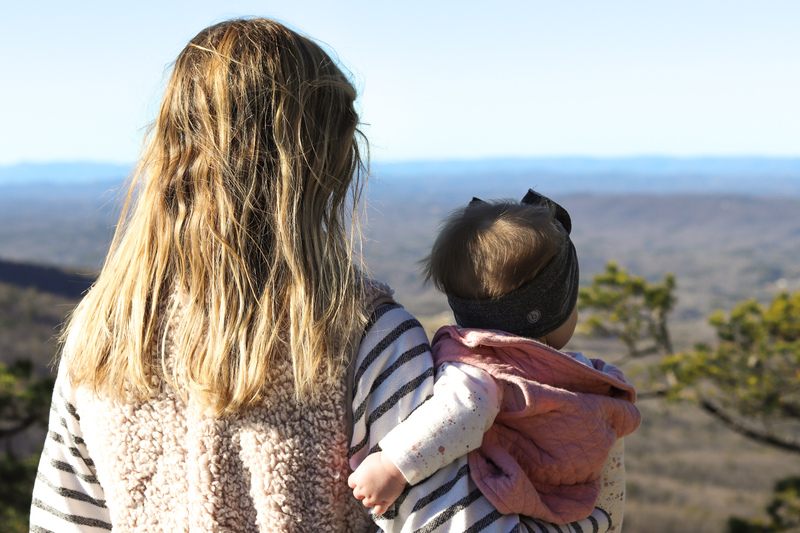 But she seemed to be okay, so we just took her out of her carrier, wrapped her up in a blanket and enjoyed the views with our lunch. The top of the ridge is covered with huge rocks to walk out onto so you can see the beautiful overlook of distant mountains. I couldn’t get over how beautiful of a day it was. The sky was so blue and clear. You could see so far out from the top of the mountain. 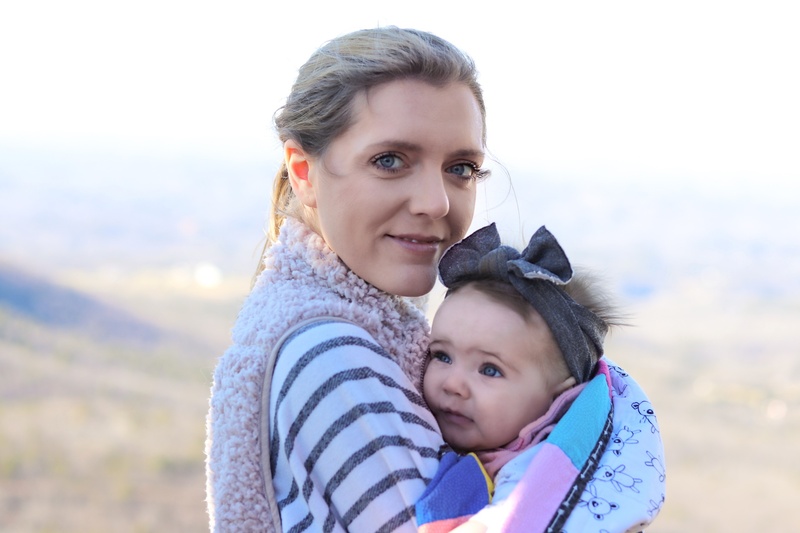 Unfortunately, we couldn’t climb out to the famous “hanging rock” because of the baby. But the rocks we could get to still provided us with amazing views. 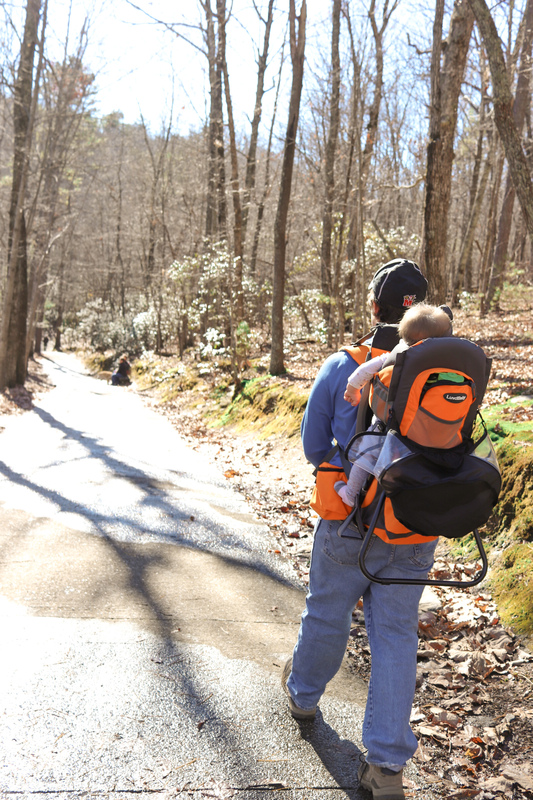 On the way down (after the scary, slippery rock part), I wanted to try carrying the baby in our new Luvdbaby hiking carrier. 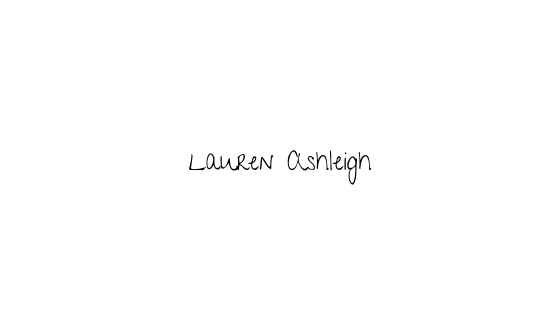 I put this on my registry because I knew we would get a lot of use out of it once Hadleigh was old enough. 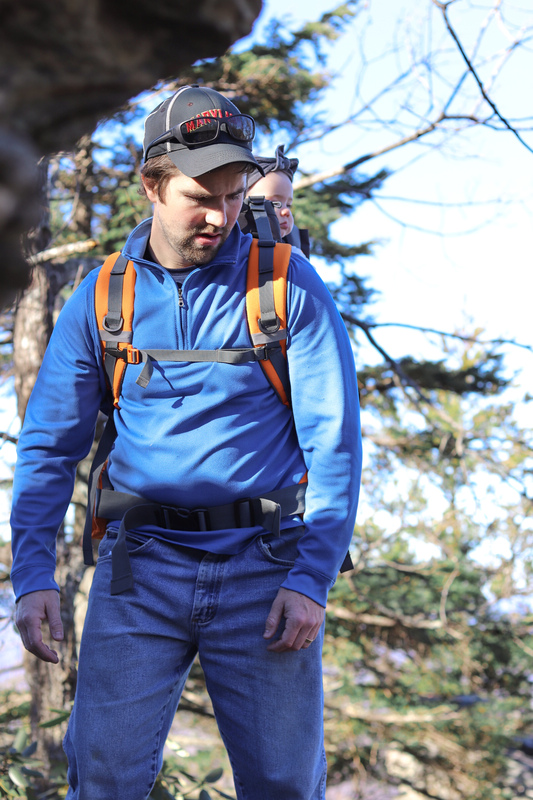 This was our first time hiking with this carrier and Brendan and I can both say we definitely loved it. It looks a little intimidating but it is very comfortable! There are a ton of pockets! We packed a large picnic blanket, water bottle and our lunch inside of it. 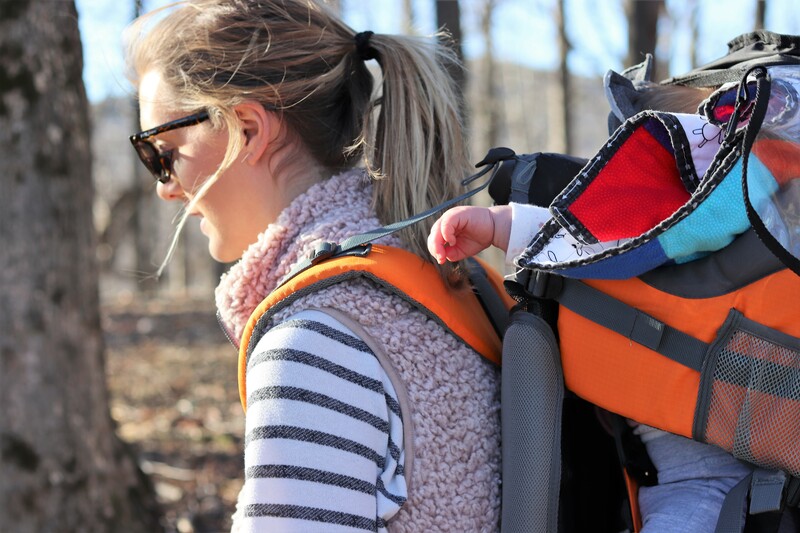 It is also height adjustable and has little foot holders for the baby. It comes with a rain/windbreaker shield, which really came in handy with the strong winds towards the top of the mountain. The stand also is handy for easily setting down the carrier to insert or remove your babe. 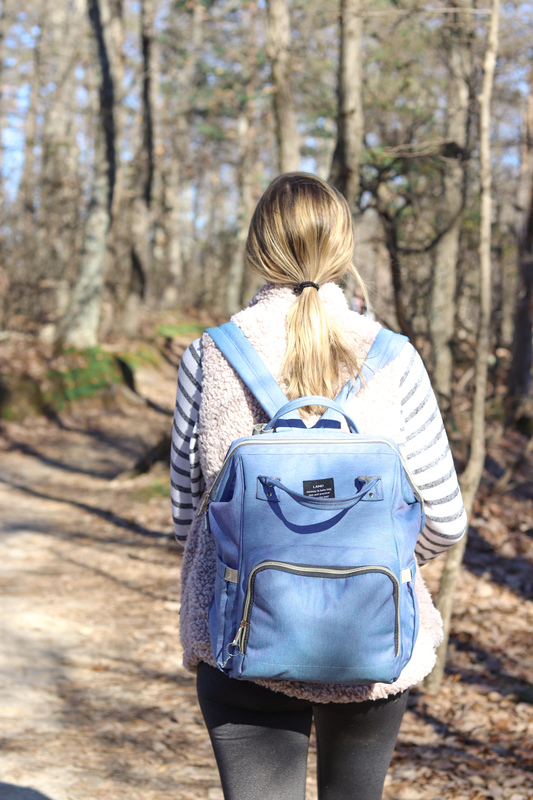 I will say it is a workout hiking with this thing on your back, BUT I am also out of shape and pretty dainty and I still survived. So if I can do it, so can you! 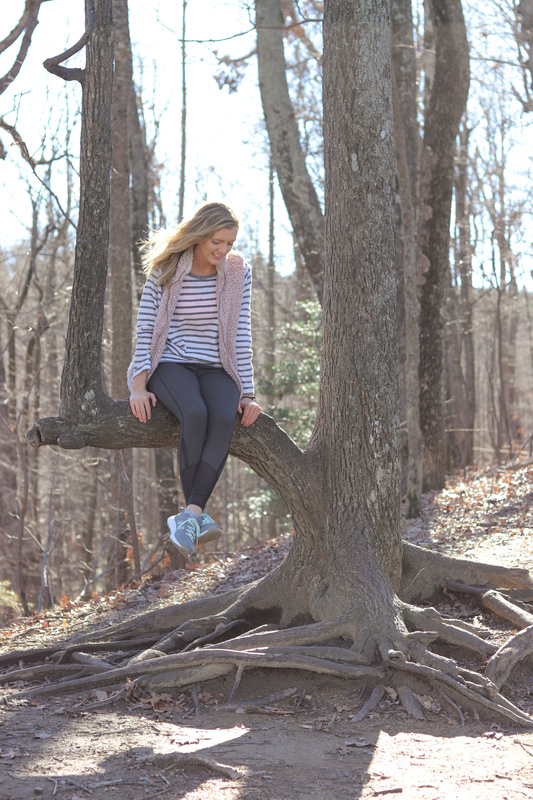 We can’t wait for spring weather and to do more outdoor activities! 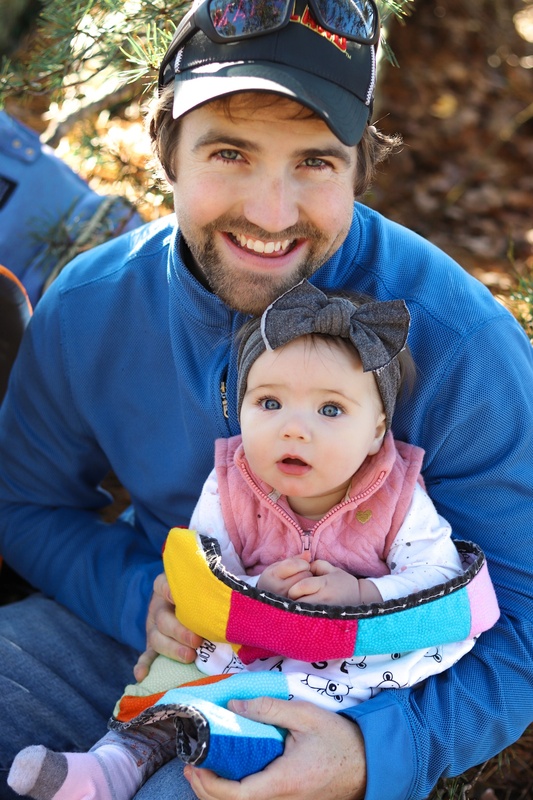 I hope our daughter learns to enjoy the beautiful outdoors as much as her dad and I do. 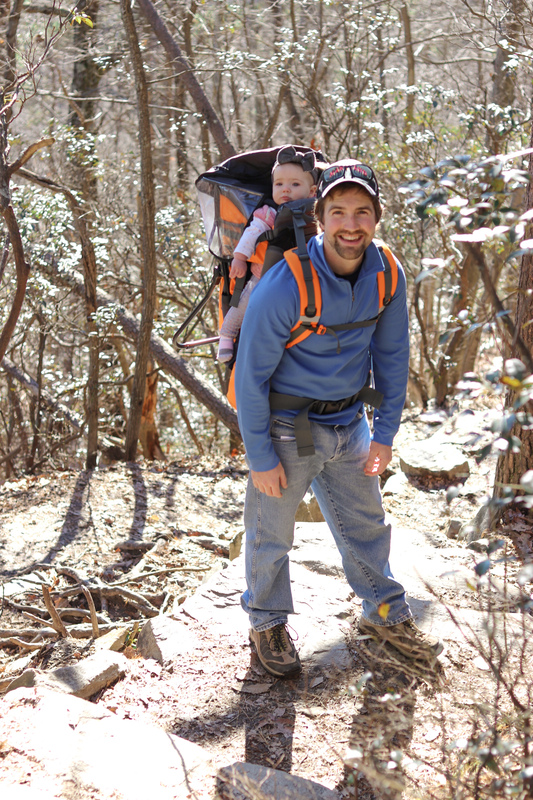 If anyone lives in the central NC area let me know some of your favorite places to hike! These are such gorgeous pictures ❤️ Can I ask what kind of camera you have ?